Peter and Jocelyn McArthur are the proud owners and operators of Heritage Estate Winery and Cidery, Barrie’s first and only boutique vineyard and cidery situated in the heart of Simcoe County. Heritage Estate offers beverages uniquely crafted out of 100% Ontario apples, free from additives or preservatives with less than half the sugar content of most larger commercial ciders. The sprawling estate includes a century farmhouse, tasting room, wedding venue and state-of-the-art on-site processing facility. 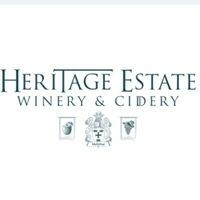 Founded in 2014, Heritage Estate Winery and Cidery sprouted from the McArthur’s passion for wine. Peter learned the craft of cider making at Peter Mitchell’s Cider Academy at Cornell University which led to the planting of over 15,000 grapevines and 1250 fruit trees. Peter’s family first settled in the area in the 1850’s so it is no surprise that Heritage Estate features a century farmhouse in addition to over 20 acres of sprawling heirloom grapevines and apple orchards. All production is on-site with state-of-the-art equipment providing superior quality and consistent taste. Peter’s experience as an engineering technologist with a business background in renewable energy gave him the confidence to invest in the production facility, providing Heritage Estate customers with the very best in quality, delivering consistent flavour in every can. Historically, North American farmers harvested apples on their farmland into hard cider until Prohibition when ciders virtually vanished from the North American landscape. Peter and Jocelyn are part of a new wave of cider makers, serving the fastest growing segment of the market with a refreshing, lower calorie, gluten-free, preservative-free alternative to beer. Copyright © Ontario's Lake Country in Orillia | Oro-Medonte | Rama | Ramara | Severn. Website by Orillia ProNet Inc.